South Korea's national security adviser was in Washington on Wednesday for his first meeting with his new American counterpart, John Bolton, U.S. officials said, amid preparations for separate U.S. and South Korean summits with North Korea. Chung Eui-yong, who is due to see Bolton on Thursday, led the South Korean delegation that met North Korean leader Kim Jong Un last month and then traveled to the United States to convey to President Donald Trump a summit invitation from Kim. Trump accepted. 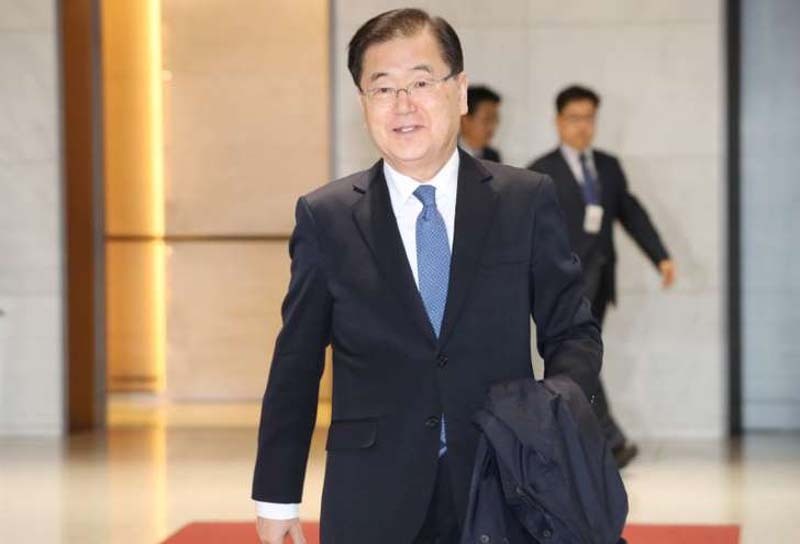 He said on Monday that he planned to meet Kim in May or early June and hoped the discussions would ultimately lead to an end of the North's nuclear weapons program. A White House official confirmed Chung's planned meeting with Bolton. The South Korean embassy in Washington, D.C., did not immediately respond to a request for comment. South Korean officials are wary about Trump's appointment of Bolton, known for his hawkish views, to replace H.R. McMaster as U.S. national security adviser. Bolton, a 69-year-old former Fox News analyst and ex-U.S. ambassador to the United Nations who took up his new post on Monday, has in the past called for regime change in North Korea and has previously been rejected as a negotiating partner by Pyongyang. Bolton said last month after he was named to his new role that the United States must use the summit to “cut to the chase” on the denuclearization issue and accused Pyongyang of seeking to “buy more time” through talks with the United States to develop its nuclear weapons. Japanese national security adviser Shotaro Yachi was also expected to visit Washington to meet Bolton ahead of Prime Minister Shinzo Abe's talks with Trump next week, a U.S. official familiar with the matter said. A spokesman at the Japanese embassy said he could not confirm this.